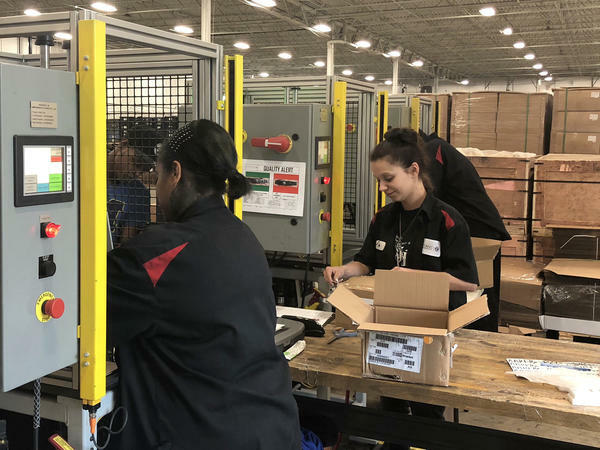 Mary Buchzeiger, CEO of Lucerne International, says President Trump's proposed tariffs on imports could destroy her Michigan-based company, which supplies automakers with parts mostly made in China. 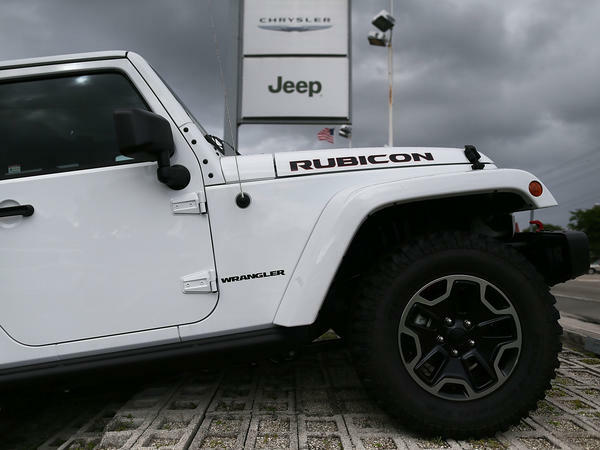 This week, she presented her case for an exemption from the tariffs at the International Trade Commission building in Washington, D.C.
Lucerne International supplies the door hinges on Jeep Wranglers, like this vehicle seen at a dealership in Hollywood, Fla.
Workers at Lucerne International's warehouse in Auburn Hills, Mich. The company employees about nearly 50 people in the U.S.
Update: On June 15, Lucerne International CEO Mary Buchzeiger said she had been notified that the auto door hinges manufactured by her company had been removed from the Trump administration's list of goods that would be subject to a 25 percent tariff. The last time Mary Buchzeiger was in Washington, D.C., she was a 13-year-old on an eighth-grade trip. This week, as the head of a small company that supplies parts to automakers, she joined other business leaders in the nation's capital to talk about President Trump's proposed tariffs aimed at China. "I'm not a political person," she says as sips coffee in a cafe a couple of blocks from the U.S. Capitol. But she says she fears the tariffs could destroy her company. During hearings before trade officials, leaders of U.S. companies, large and small, voiced both concern and support for the president's strategy. Buchzeiger pleaded her case, hoping to save her company. She owns and runs a business founded by her father, Lucerne International in Auburn Hills, Mich. It's a small-parts supplier. But it's a big supplier to Chrysler's Jeep brand. Lucerne International provides all the hinges for the Jeep Wrangler. "They're all class A forgings," she says proudly. "Our company is actually one of the only ones in the world that can produce class A forgings," which are parts visible on a vehicle's exterior. "It's polished jewelry on the outside of a vehicle," she says, "It can't have defects in it; nicks, scratches, dents, dings, anything like that. ... It's gotta look pretty." Check out the door hinges on the next Jeep Wrangler you see. They came from Buchzeiger's company. Those hinges and about 90 percent of the parts Lucerne International supplies to U.S. automakers would be hit by a 25 percent tax under Trump's tariffs. The tariffs are supposed to protect U.S. businesses, but Buchzeiger doesn't see it that way. "They're attacks on U.S. companies that are using Chinese goods," she says. And that's the rub. Buchzeiger's company produces most of its parts in China. "I would love to be able to manufacture these parts in the U.S.," she says. She says she's tried several times to find American factories to fill her orders. But she hasn't found "one company that can handle even half the volume of one part" Lucerne International produces. "There's no capacity left for manufacturing here," she says. Currently, Buchzeiger is investigating the possibility of putting a plant in Flint, Mich., where she was born. But if the tariffs hit now, she fears she'll be out of business before that could even happen. A couple hours after the conversation over coffee, Buchzeiger sat down in a stuffy and crowded government hearing room to tell her story. She had five minutes to make the case for an exemption before a panel of trade officials. She read forcefully from a prepared statement: "The tariffs proposed by President Trump would cripple my business and many like it in the Midwest," Buchzeiger told the panel of trade bureaucrats. "I'm fighting for the life of my company and for the livelihood of my employees. And I'm fighting to protect an intricate auto supply chain that creates hundreds of thousands of U.S. jobs." Buchzeiger answered some brief questions from the trade panel, and waited while other business people made their cases, for and against the tariffs. "I think it went well," she said as she left the hearing. "I got the message across and it was exactly what I expected. I'm hopeful that they heard our message." Buchzeiger is a Republican. She says she hopes Trump will get the message that his tariffs could harm many businesses and workers in the upper Midwest — "Trump country." If or when those tariffs take effect remains unclear. So, for now, Buchzeiger can only wait and hope. This next story underlines an awkward reality of the trade battle between the United States and China. When Americans import Chinese goods, what's really happening is this - an American business is using Chinese goods and making a profit. So as President Trump imposes tariffs on China, NPR's John Ydstie met an American business owner who thinks they could destroy her American company. JOHN YDSTIE, BYLINE: Mary Buchzeiger came to Washington on a mission. It's not a place she visits often. MARY BUCHZEIGER: I'm not a political person. I'm not in politics. I don't - you know, this is my first go-round in Washington. The last time I was here, I was 13 years old for my eighth-grade trip. (Laughter). YDSTIE: Now she's here again, sitting in a cafe a couple of blocks from the Capitol building, preparing to plead her case before Trump administration trade officials. 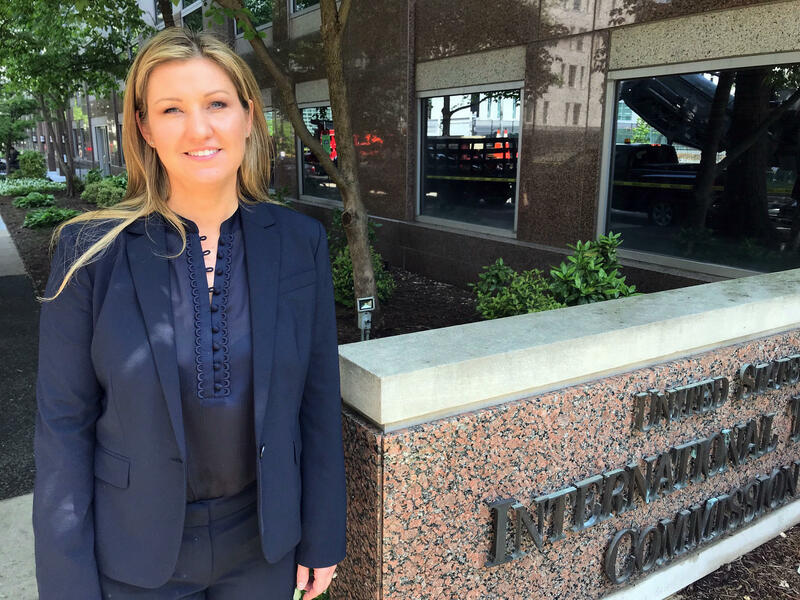 Buchzeiger owns and runs a business founded by her father, Lucerne International, in Auburn Hills, Mich. It's a small parts supplier, but it's a big supplier for Chrysler's Jeep brand. BUCHZEIGER: We make all of the hinges that go in the Jeep Wrangler. They're all Class A forgings. Our company is actually one of the only ones in the world that can produce Class A forgings. YDSTIE: Class A forgings are parts visible on a vehicle's exterior. BUCHZEIGER: It's polished jewelry on the outside of a vehicle. It can't have defects in it - nicks, scratches, dents, dings, anything like that. It's got to look pretty. YDSTIE: Check out the door hinges on the next Jeep Wrangler you see. They came from Lucerne International. Those hinges, and about 90 percent of the parts Buchzeiger's company supplies to U.S. automakers would be hit by a 25 percent tax under President Trump's tariffs. The tariffs are supposed to protect U.S. businesses, but Buchzeiger doesn't see it that way. BUCHZEIGER: They're attacks on U.S. companies that are using Chinese goods. YDSTIE: And that's the rub. Buchzeiger's company produces most of its parts in China. BUCHZEIGER: I would love to be able to manufacture these parts in the U.S. We've tried. But here in the United States, there is not one company that can handle even half the volume of one part-number that I produce because there's no capacity left for manufacturing here. YDSTIE: Buchzeiger has searched for factories in the U.S. several times. Currently she's investigating the possibility of a plant in Flint, Mich., where she was born. But if the tariffs hit now, she fears she'll be out of business before that could even happen. A couple of hours after our conversation, Mary Buchzeiger sat down in a government hearing room to tell her story. She had five minutes to make her case for an exemption before a panel of trade officials. Audio recording wasn't allowed, but we talked to her as she left the hearing room. BUCHZEIGER: I think it went well. And I got the message across, and it was exactly what I expected. I'm hopeful that they heard our message. YDSTIE: And here are a few lines of her plea to trade officials. BUCHZEIGER: The tariffs proposed by President Trump would cripple my business and many like it in the Midwest. I'm fighting for the life of my company and for the livelihood of my employees, and I'm fighting to protect an intricate auto-supply chain that creates hundreds of thousands of U.S. jobs. YDSTIE: Buchzeiger is a Republican, and she says she hopes President Trump will get the message that his tariffs could harm businesses and workers in Trump Country. If or when those tariffs will take effect remains unclear. So for now, Buchzeiger can only wait and hope.